Ringed at Killingworth, Tyne and Wear, UK in Mach 1989 as a first winter bird, this was identified by it colour ring BLUE 3BU at Thorpe Perrow on the 22 May 1998 by EDRG. 81km/50 miles. Ringed by the Sorby Breck RG on the 22 August 2016 at Bishopthorpe, York, and with a colour ring combination left below knee RW(346Y), right below knee M. This swan was identified by the colour rings at Fountains Abbey on both the 29 December 2016 and the 11 January 2017 by EDRG. 37km/23 miles. More cygnets were colour ringed at Studley Park recently. They are Red darvics XFB, XFD and XFF. If you see these swans at all or any other Red Darvic rings please leave a comment on this page or tweet @JillWarwick or @EDRInging. A few pictures (© Mollie Thomas) from last Sunday of the three cygnets which were ringed at Lightwater Valley theme park, walking sedately back to the water – they are Red – XDY, XDZ and XFA. If you see these swans at anytime, please leave a comment or tweet @JillWarwick or @EDRInging. Mute Swan W11446 ringed as an adult and fitted with red darvic TYX has been controlled by the Sorby Beck RG at Campsall, near Doncaster. Ringed on the 5 September 2004 the swan was re caught in Campsall on the 12 August 2016. At least 12 years old, the bird had travelled 50km (31 miles) south. Busy ringing swans at Kingfisher Caravan Park, Knaresborough recently. The adult female seen here had been previously ringed. Look out for these RED darvic cygnets and their mother. Any sightings, please contact Jill Warwick at @JillWarwick or @EDRInging or leave a comment. Ringed on the 22 January 2009 at Allerton Bywater by the Sorby Breck RG, this bird was seen at Coney Garth, Knaresborough on the 7 February 2016, a distance of 31km (19 miles). This bird was ringed as a juvenile on 16 August 2008 at Newburgh Priory, North Yorkshire by the Sorby Breck RG and was seen 27km (17 miles) away at Lightwater Valley, North Stainley on the 21 January 2016. Ringed by the Sorby Breck RG at Bradford Moor Park, Bradford on the 18 September 2015, this bird was seen again on the 15 January 2016 and again on the 27 January 2016 at Glasshouses, near Pateley Bridge, North Yorkshire. A distance of 32km (2o miles). 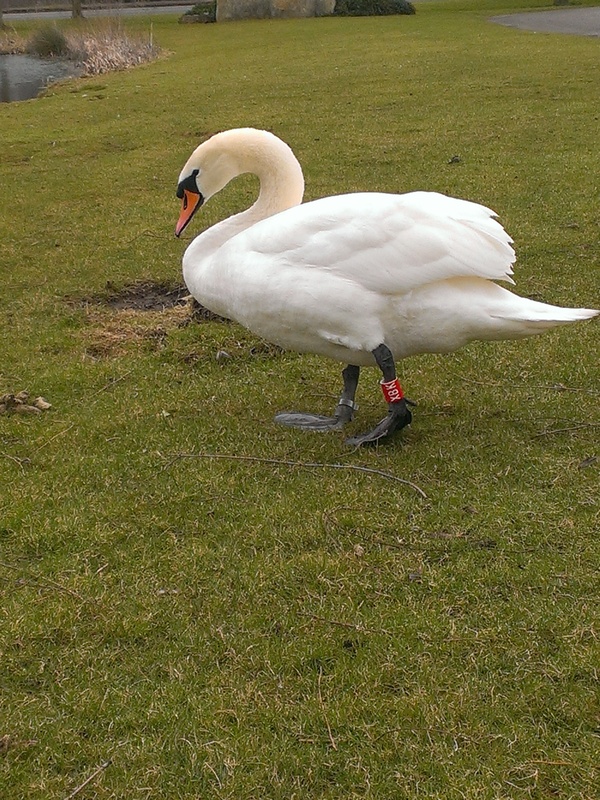 This swan was ringed as a juvenile on the 17 July 1993 at Billingham, Stockton -on-Tees by the Tees Ringing Group. It was seen on the 20 August 2000 at Bar Lane Gravel Pit, Knaresborough, a distance of 65km (40 miles) but sadly later found dead at Hay-a-Park, Knaresborough on the 27 December 2007. This swan was originally ringed by the Severn Valley RG at Coney Garth, Knaresborough on the 16 March 1996 and then re-trapped and re-ringed by the EDRG at the same venue on the 22 August 1999.